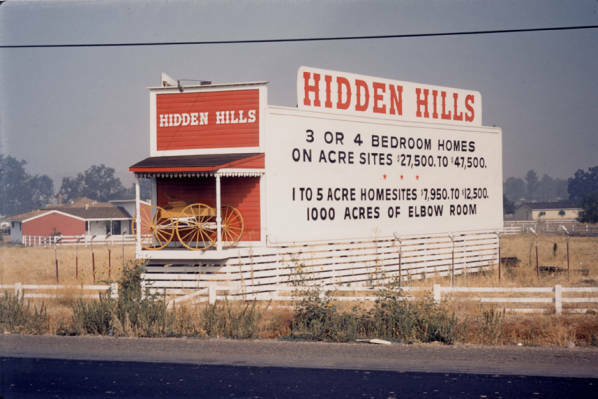 From the fantastic archives of CSUN’s Oviatt Library Digital Archives are two color photographs, by Bob Copsey, of Hidden Hills, under development, in 1957. The exclusive horse and ranch-oriented neighborhood, west of Woodland Hills, was offering home sites from $7950 to $12,500 and 3-4 bedroom homes from $27,500-$47,500. Today, homes in this gated area have sold for $1.6-$5.7 millions. Adjusted for inflation, $30,000 in 1957 would be worth $226,000 today. $226,000 is probably what some homeowners in Hidden Hills have spent to remodel their kitchen.